Buy from a massive range of best value carrier bags now, including clear, coloured, biodegradable and printed carriers. A great way for a retailer to increase publicity - add your logo to the side of a carrier bag for ready-made mobile advertising! Vest - The best known carrier bag in the UK and beyond, traditionally used by supermarkets, smaller food stores, general stores and market traders. Made from high-density polyethylene (HDPE) and available in a variety of colours, plain or printed, these bags are lightweight but strong. Handles are attached to each side of the bag make it look like a vest from the front, hence the name. Provided they are not over-filled, these bags are capable of handling regular shopping with ease. Patch handle - A more glossy and sturdy carrier bag, commonly used by high street stores to impress their customers. Made from thicker polythene than vest carriers to provide extra strength, these rectangular bags have a handle punched out of the top, reinforced by an extra patch of polythene, which gives the bags its name. Available in clear or coloured polythene and the perfect bag on which to print a design or logo to advertise the retailer, hence the popularity with high street retailers. Varigauge - Similar in appearance to its patch handle cousin, the varigauge carrier bag is rectangular in shape with a handle punched out. However, the clever use of a varied gauge - or thickness - of polythene, which is twice as thick at the top of the bag than it is at the bottom, means that the need to reinforce the handle with a patch is avoided. Available in a variety of colours, these strong bags with extra room thanks to a bottom gusset, are very popular with retailers keen to make a good impression with customers. Clip close - These strong rectangular bags have an integral white clip attached right across the top of the bag that clip closes shut, giving the bag its name. Made from thick clear polythene with a side gusset, these bags allow retailers to display their products, whilst not compromising on bag strength or quality. The sturdy clip also allows you to hang up the bag - and contents - to really show it off. Flexiloop - These luxury carriers take their name from the flexiloop handle that is attached - by heat-welding - to the inside of the bag on both sides. Popular with supermarkets who sell them as ‘Bags for life’ - encouraging customers to reuse the bag - flexiloop carriers are made from thicker polythene than regular carriers, which makes them more expensive to produce. Paper versions of the flexiloop carrier bag are popular with boutique shops or fancy high street retailers. Duffle - A sturdy polythene bag featuring a cord threaded around the top opening and down the sides of the bag. Pull the cord to close the bag tight and loosen to open. Useful for carrying bulky or weighty items and handy to carry, so often used by sportspeople as a kit bag. Also popular with sports shoe retailers. Drawstring - Less sturdy than the duffle bag, so not suitable for similarly bulky contents, but operate on a similar principle. Drawstring bags feature two strings looped around the opening of the bag, with the ends of the drawstring appearing through separate openings adjacent to each other. When pulled at the same time, the strings tighten together and the bag closes. Typically made from clear polythene, these bags are a popular way of displaying products in a shop. Grip Seal - A cross between a carrier bag and a grip seal bag, these bags contain an integral grip seal that runs across the width of the bag just below the cut-out handle. Simply squeeze the grip seal between forefinger and thumb to seal the bag shut, providing protection from rain or other external contaminants, then gently pull apart to open and repeat as many times as you wish. With a clear polythene front, a handle for hanging and a glossy finish, these bags are a great way to display your products. Printed carrier bags are an ideal way for businesses to advertise directly into their local community. Take a plain patch handle carrier and turn it from the smart, sturdy carrier bag it normally is into a walking advert for your business. Businesses have to provide carrier bags to their customers anyway, so why not pay a little more for them and get something back from the carrier bags once they have left your shop. By adding your company logo or design to one or both sides of your carrier bags, you not only make your business look more professional and more eye-catching, but you let your customers act as mobile advertisers, when they leave your store and walk around others in the area with your company branding there for all to see. You can even add a slogan or advertising message to tell your potential customers exactly what they need to know about your store. All this, carried straight out into the heart of your target market and the hundreds or thousands of other potential customers out there. Not only do printed carriers help attract new customers, but they also reinforce the message to existing customers that you are a professional, reliable and smart retailer. So next time they go to their cupboard or car boot and see your carrier bag, they see your bag, that initial good impression is reinforced and they move that step closer to being a return customer. So why bother with plain carrier bags? Go one step further and design your own printed carriers, complete with your company branding, to take your business to the next level. Discount Carrier Bags provides customers with an instant quote on a range of printed carrier bags. Get your very own design or logo printed on one or both sides of a quality thick carrier for as little as 4p a bag. Get a quote in 60 seconds, any time of day, 24/7! With instant real-time quotes on personalised printed carrier bags, Discount Printed Carrier Bags is the place to go for bespoke carrier bags at terrific discount prices. Get your design printed on strong, smooth, high quality polythene bags in a range of sizes, from just 4p a bag and with free delivery in the UK. The home of printed carrier bags online - offering high quality 55-micron thick carrier bags printed with your very own design. With a free instant quote, the lowest prices online - starting at just 4p a bag - and free UK delivery, this website is the place to go for printed carriers - the best way to advertise your business. If you need a carrier bag of any style, size or colour, then Carrier Bags is the website for you. They provide customers with a huge range of polythene carrier bags, from varigauge carriers to vest carriers and with a selection of biodegradable alternatives. A useful resource for anyone looking to buy carrier bags. Featuring lots of information of different types of carriers - including bespoke printed carrier bags - and where you can buy them, this website will definitely help you find the right carrier bag for you. Find out more about printed carrier bags and a range of other plastic carriers at this useful website, including details of each type of bag and the best place to buy discount printed carrier bags online. Printed Bags Direct offers customers information and details on where to buy a wide range of stock carrier bags and bespoke printed carrier bags, so you can find out everything you need in one handy website. An excellent resource on printed carrier bags and stock carrier bags, with detailed descriptions on a range of carrier bag categories. Coloured Bags Direct is a website dedicated to printed carrier bags. A division of industry-leading manufacturer Polybags, they offer customers colour printing on a range of polythene carrier bags. Are you looking for printed carrier bags, patch handle carrier bags or any other style from a wide range of plastic carriers? This website is the site you need to help you make that all-important decision and find the right carrier bag for you. Coloured Bags offer colour printing of carrier bags to help you advertise your business. Get a free quotation on your own design printed carrier bags, or choose from a wide range of stock carriers. This handy website offers a useful resource on plastic carriers and printed carrier bags, including details of the types of bags available - from clip close carriers to patch handle carriers - and where to buy them. 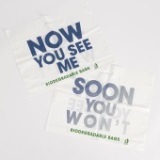 For a professional look for your customers, why not brand your carrier bags! Goldstork: A free online 'best-of-the-web' directory listing specially selected information on a wide range of plain and printed carrier bags. PackagingKnowledge: The UK's premier polythene packaging knowledge website, containing loads of useful information and in-depth articles on carrier bags, as read by those in the industry. PlasticBags.uk.com: List products for free as a manufacturer or, if you're shopper, simply browse a massive selection of carrier bags websites on this unrivalled polythene packaging directory. Single-use carriers? No such thing! The carrier bag is often portrayed in the media as the single biggest cause of pollution and litter on the planet. Most commonly, the high density polythene (HDPE) carrier bag used by supermarkets is singled out as the biggest culprit. These bags, which are subject to a government levy in many countries - meaning customer have to pay a few pence or cents for each bag they use - are often referred to as “single-use carriers”, which is a term that is not only misleading but also irresponsible. Carrier bags should be reused as often as possible and by calling them “single-use carriers” - including in newspaper articles widely criticising the use of such bags - the implication is there that the bags should be thrown away. This is giving entirely the wrong message to customers and does not represent the facts. 82% of UK households reuse over half of all carrier bags they use, with 59% reusing all of them (Waste Resources Action Programme report, 2005). There are so many things you can do with a carrier bag once you’ve used it to carry your shopping home. The most obvious is to take it back to the shop and use it again for its original purpose - to carry shopping! But you can also use carrier bags for wrapping your packed lunch, or as a portable laundry bag when you go on holiday, or wrapping shoes in a suitcase to keep your clothes clean. There are loads of things you can use it for if you put your mind to it, so use your carriers again and again. Even when your carrier has seen better days and you’re ready to throw it out, you can give it one final hurrah and use it as a rubbish bag before throwing it in the bin. There’s no such thing as a single use carrier bag - at least there shouldn’t be!